This entry was posted on Tuesday, December 18th, 2018 at 5:29 pm	and is filed under Uncategorized. You can follow any responses to this entry through the RSS 2.0 feed. You can skip to the end and leave a response. Pinging is currently not allowed. I love the new tatoo. Of course Nitro is always going to in your mind and towards the front of it. I am so glad he brought you 2 Tiny Tots to help fill your life with laughter. 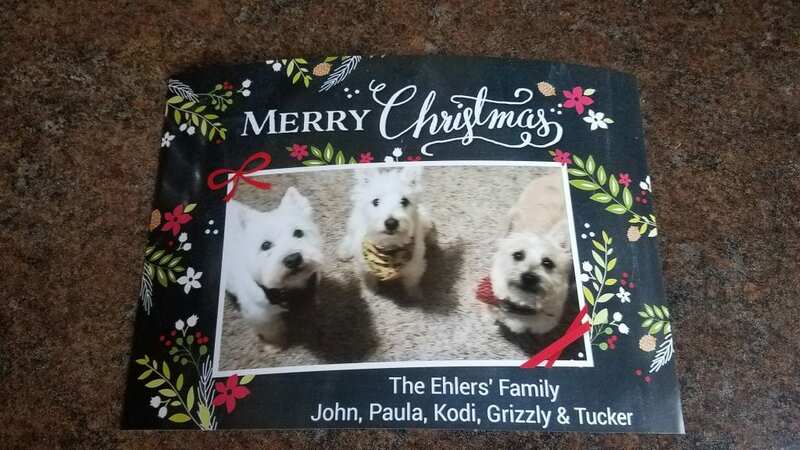 I love each and every ornament and your Christmas cards of the 3 babies. Love your new tattoo! 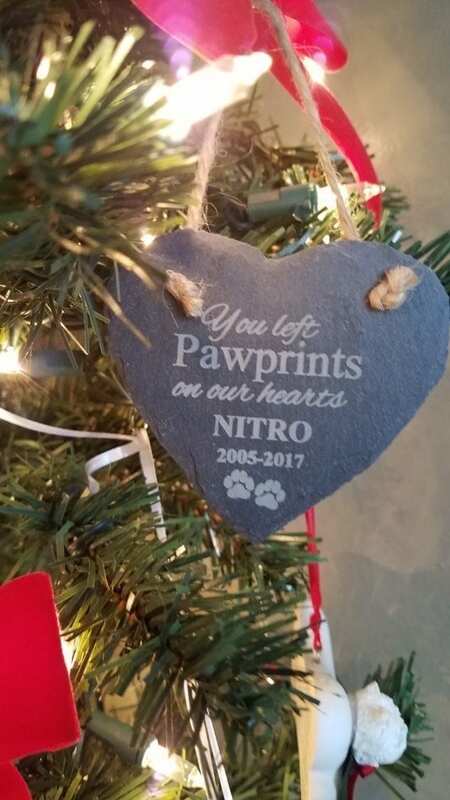 Nitro was such a Warrior and he made you into a Warrior too. So the tattoo speaks to both of your spirits. So fitting. 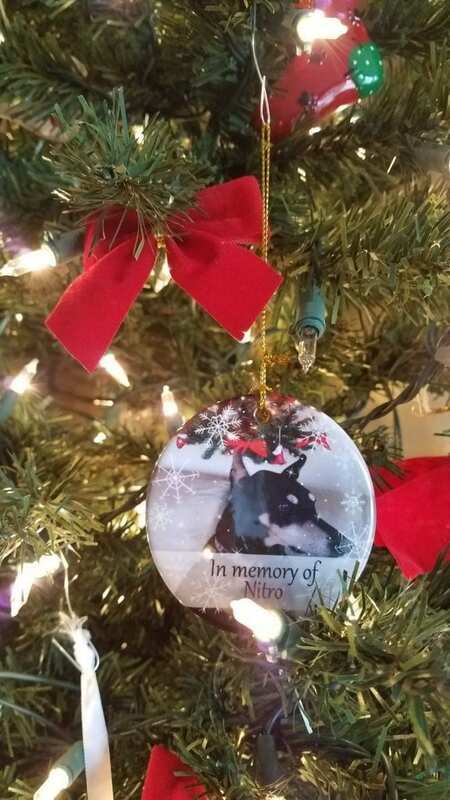 I love how your tree encompasses your whole heart with the each ornament both past and present. Merry Christmas my friend sending much love! 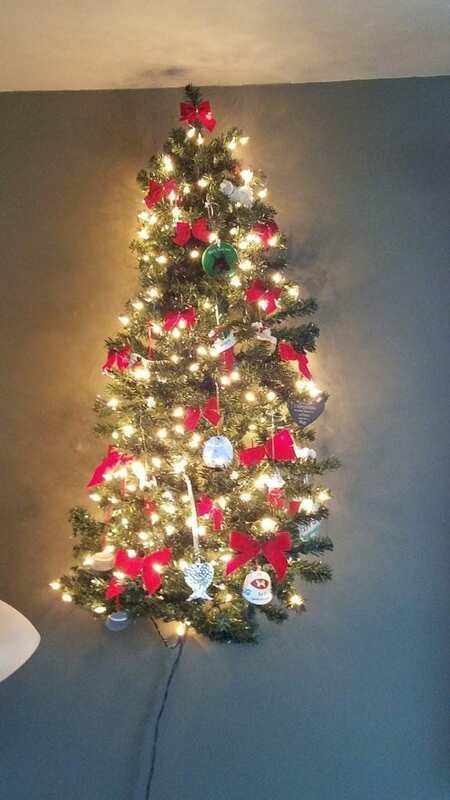 The tree does, indeed, encompass your whole heart ❤ And you’ve done it all on a three foot tree hung on a wall!!! 😎 I thoroughly enjoyed focusing on on each ornament. So much love and thought went into each one. 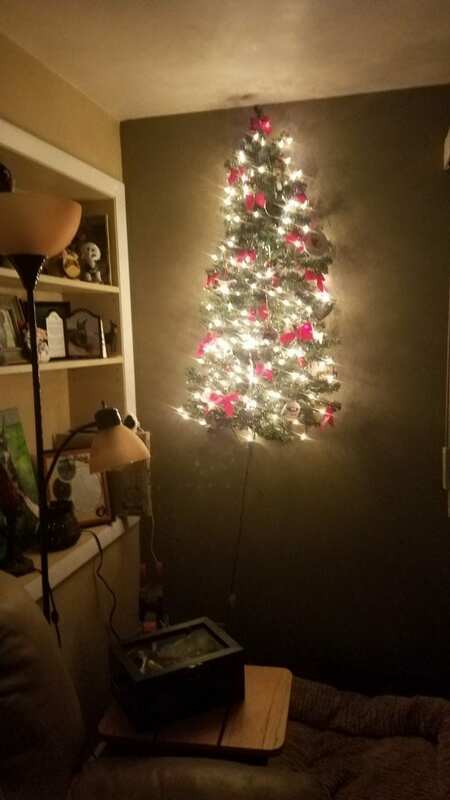 Curious which one of you two came up with the idea of deciding to get half a three foot tree and then hang it on rhe wall? And I can’t wait to see the video of the gift unwrapping either!! Oh I love your tree Paula! What beautiful ornaments, it’s truly a lovely sight (and I don’t say that lightly, as we aren’t all that Christmasy around here!). And the new tat is PERFECT! Hoppy pawlidays to you and the pack! May 2019 be a year of fun little terrorist acts around your hose and many good times with Angel Nitro orchestrating everything from above. I have been thinking of getting new ink. I don’t know if that goes to show how much the two of us are in tune but there’s that. No, Christmas will never be the same, but then nothing is anymore, is it. Love that tree!! That is the first tree I have ever seen off the ground that was not upside down, lol. Love the tat!! I have been thinking of getting one in the same area but a very simple “one or 2 line” silhouette of Rosie’s face. If I can find her likeness, it is mine. Right where I can see it every day. Somebody that I work with has a sick pup. He brought him into work today so that I could show him how to pill and give insulin injections. I gave Buster a hug (he is a pittie) and memories of my girl came flooding through like it was yesterday. 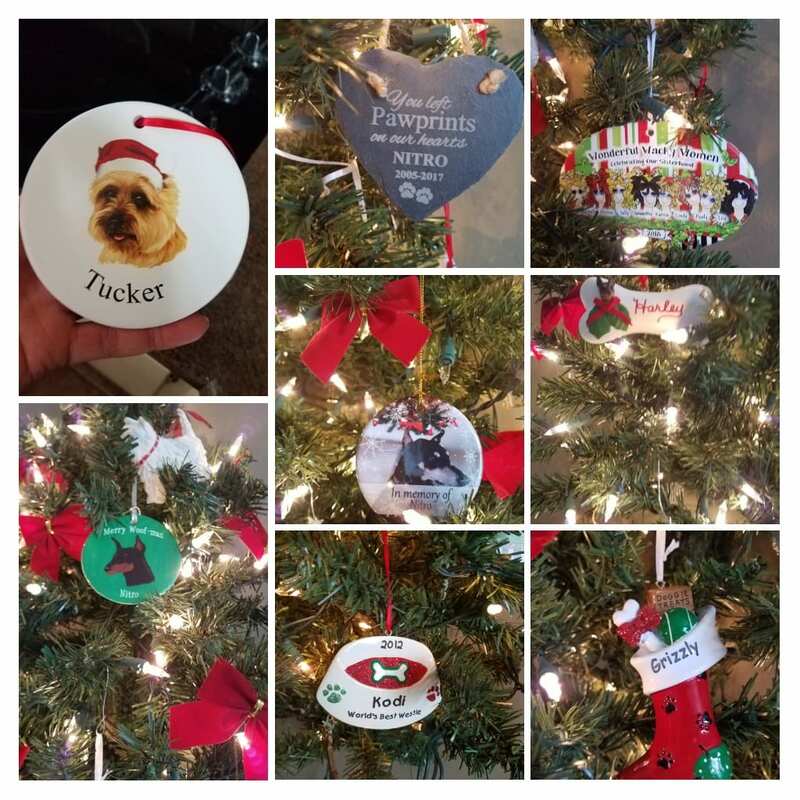 I wish a peaceful Christmas full of pup filled fun… those little furbabies of yours are gorgeous! Your boys are adorable, and I’m so happy that Tucker has fit in so well. He was just what your home needed. Nitro did well.